Thrace (Greek Θρᾴκη, Thrákē, Bulgarian Тракия, Trakija, Turkish Trakya) is a historical and geographic area in southeast Europe. 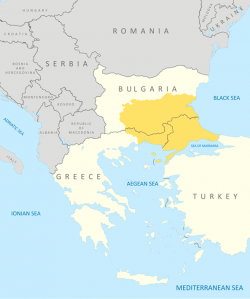 Today the name Thrace designates a region spread over southern Bulgaria (Northern Thrace), northeastern Greece (Western Thrace), and European Turkey (Eastern Thrace). Thrace borders on three seas: the Black Sea, the Aegean Sea and the Sea of Marmara. In Turkey it is also called Rumeli. Ancient Thrace (i.e. the territory where ethnic Thracians lived) also included present day northern Bulgaria and parts of eastern Serbia and eastern Macedonia.